Epic trekking through the remote mountains of Bhutan. What I liked about travelling with Mountain Kingdoms was that their client wellbeing is paramount, their long standing relationship with BTCL ensured a totally trouble free trip and the quality of hotels outside the trek. Thank you all for making the Gangkar Punsum trip such a memorably fantastic one. May our next adventures be so fortunate. I just wanted to say a big thank you for our Bhutan adventure. Truly a trip of a lifetime for all of us. I have really enjoyed looking at the photos and recounting all the tails to friends and family...All have been stunned by the scenery and the beauty of Bhutan. Gangkar Punsum at 7,550m/24,770ft is the highest mountain in Bhutan and also happens to be the highest unclimbed peak in the world. It sits astride Bhutan’s northern border with Tibet and the mountain and surrounding region has received very few visitors. This exciting trek is a thrilling exploration of the largely unexplored mountains and valleys on the southern side of Gangkar Punsum. Driving to the Bumthang valley in central Bhutan you trek north out of the valley through wild country to the base of Gangkar Punsum, with time to explore the remote Zhigeyphu valley, an incredibly beautiful valley which few westerners have ever seen, let alone explored. You have two full days to investigate and enjoy this wild country and the fabulous views of Gankar Punsum, and perhaps even to hunt for the elusive ‘yeti’. You then return to Bumthang by way of an exhilarating crossing of the largely untrodden Thole La Pass at 4,766m/15,537ft. Joining this extraordinary trek you will be a real pioneer and one of the very first to set foot in this magical region! This is a tough trek and should only be attempted by clients in an excellent state of health and fitness. Having said this, it is an extremely worthwhile objective and you will be able to truly say that you have trekked to one of the very remotest parts of the Himalaya. Fly to Paro. Drive To Thimphu. Drive to Tongsa and on to Jakar. Drive to Chumey and Tharpaling. Ridge walk and descend to Chumey Valley. Return to Jakar. Trek to Bamurpa via Tsawuu and Shingo. Day trek from Bamurpa. Trek to the Zhigeyphu Valley. Two days of exploration around the valley. Trek to Tsho Shap. Visit Tsampa Monastery en route. Cross the Thole La pass. Trek to Tashi Sa. Trek to Chokchum and end trek at Dur. Drive to Jakar. Fly to Paro. Walk to Taktsang Monastery and sightseeing in Paro. On some of our most remote and longest treks you will be led by a Mountain Kingdoms Appointed Leader, often supported by a local guide. Your leader will be very experienced having led many of our trips across the globe and will often have a particular expertise in the region you are visiting. You will be met on arrival and transferred to your hotel. The Shangri La is a comfortable 4 star hotel situated near the British Embassy. You may choose to eat here tonight or venture out into Thamel with its many bars and restaurants. Day 3 - Fly to Paro. Drive To Thimphu. Today you will fly to Paro. Particularly exciting is the flight through the Bhutanese foothills and the landing at the small airstrip at Paro. After receiving your Bhutan visas and meeting your guide and driver, you will make the two-hour drive on twisting mountain roads to the least visited of all Himalayan capitals, Thimphu. You should arrive around dusk and have time to wander the main streets before turning in early. Day 4 - Drive to Tongsa, 2,200m/7,218ft - 7 to 8 hours. Leaving the Thimphu Valley, you climb slowly up to the Dochu La, 10,000ft/3,000m, passing Simtoka Dzong, one of the earliest monastery/fortresses in Bhutan. From the pass on a clear day there are panoramic views of the Eastern Himalaya, including Gangkar Punsum, the highest peak in Bhutan. The long descent from the pass takes you into the fertile valleys of Punakha and Wangdiphodrang. Wangdiphodrang has a large monastery/fortress built in the shape of a sleeping bull. The first ruler of Bhutan, Nawang Namgyal had a vision that if he built it in this shape peace would come to the land. The Dzong built in the 1600's suffered a terrible fire in 2012 and is now in the course of being renovated. The road then begins the long climb over the Pele La, 11,000ft/3,350m. Some parts of the road are literally cut into the rock face and landslides are not unknown in this area. Then begins the long winding descent. The largest castle in Bhutan, Tongsa Dzong, can be seen for a long way off before you get there. This was the seat of power for the father of the first king of Bhutan, and it is tradition still that the Crown Prince becomes Tongsa Penlop (governor) before ascending to the throne. Day 5 - Drive to Jakar in the Bumthang region, 2,560m/8,400ft - 3-4 hours. From Tongsa you cross the Yotong La, 11,000ft/3,350m, and descend to the valley of Chumey in the heart of the famous Bumthang Yatha weaving region. Close to the 7th century Zugney Lakhang (temple) are two Yatha shops. The first shop has about 10-15 girls who do the spinning, dyeing and weaving. You then continue to the Bumthang Valley. The Bumthang valley is one of the most sacred in the kingdom and innumerable legends surround the area. It is here that the kings are cremated and the present royal family trace their ancestry back to a famous saint called Pemalingma who was a smith in Jakar township. It is said that he discovered burning treasures at the bottom of a lake and that female heavenly spirits visited him encouraging Pemalingma to preach their contents around the country. It is said that whenever he spoke crystalline flowers appeared in the sky and dissolved as they drifted down to earth. Day 6 - Drive to Chumey and Tharpaling. Walk along the ridge and down through the forest to Chumey Valley - 4 hours. Drive to Jakar. Today you drive back to Chumey (around 1 - 1½ hours' drive) and up to the cluster of temples at Tharpaling - a sacred spot and place of meditation founded by Geluwa Lonchen Rabchampa (1308-1363) during his self-exile from Tibet for ten years. Several picturesque monasteries dot the hillside above the Chumey Valley with views over Domkhar (Chumey) and Domkhar Summer Palace. After a picnic lunch, you start the 4 hour walk along an old trail back towards Chumey. The path starts out beneath craggy cliffs, from where it climbs fairly gently up to the ridge top and reaches the Shutre Sae Pass at 3,700m/12,139ft. Sited on the pass in a glass case is a statue of the founder of Tharpaling. From here the views are phenomenal - looking south you can see over the Chumey/Domkhar Valley with the Black Mountains in the distance. The other way you get fabulous and unexpected views over Jakar town with the new airport runway and the dzong clearly seen far below. Beyond and further north, you can see towards the high mountains - perhaps even Mount Gangkar Punsum on a clear day. You descend from the pass in beautiful forest, nearly all downhill. On the higher reaches, you pass through pine, fir and rhododendron forest. Eventually you reach the road again at a huge area of prayer flags where you will meet your transport and head to your hotel in Jakar around 40 minutes away. Day 7 - Drive beyond Toktu Zampa to Tangbi, 2,640m/8,662ft. Trek to before Khakthang army camp, 2,834m/9,297ft - 5 1/2 hours. It is a half hour drive from Jakar to Tangbi crossing the river on the suspension bridge. On arrival at Tangbi you will meet your trek crew, horsemen and horses. Exciting stuff as the lads start loading the animals with all the equipment, supplies and your main bags. Every journey of a thousand miles starts with a single step! You begin your trek by following the left bank of the river through cultivated farmland and hamlets, following a rough jeep track. There are some beautiful examples of typical Bhutanese farmhouses, as well as one of two temples and water driven prayer wheels. In under 2 hours you come opposite Drapham Dzong. You will just make this out as ruined fortifications on top of a small hill. In recent years some archaeological work has been done here apparently. Just beyond here you cross the river on a foot bridge and then back track down the valley on the opposite bank to visit Nga Lahkthang, 2,786m/9,141ft. It is about half an hour back down from the bridge to the temple. Nga Lahkthang dates back to the 7th century when it was built by the lama Namkha Samdrup. There is a young man living here called Wangyal. Apparently his wife's family and her ancestors have looked after the temple since the 7th century. Wangyal married into the family, which like many Bhutanese families follow a tradition of passing the property down through the female line. This is a good place to have a picnic lunch. You return to the bridge in half an hour and cross it, and carry on for another half hour to cross a small bridge to Nathe village. Just beyond here there is a large monastery quite high up on the hill. You are now beginning to leave civilization behind and entering into forest and jungle. In any case it's only another half hour to the camp situated before an interesting chorten with a tall prayer flag. This is a very short distance before the army camp. The army camp is just a small post where people's permits are examined. At certain times of the year local people are given permits to travel further up the Chamkha Chhu valley to collect cordyceps. Collecting cordyceps is big business in the Himalaya! Basically, it is a caterpillar that is killed by a particular type of fungus and it is believed to have extremely potent medicinal properties. In Bhutan the traditional collecting grounds of cordyceps are carefully controlled, hence the small army post. Day 8 - Trek to Gophu or Kuphu Camp, 3,276m/ 10,748ft - 7 hours. If a camera trap was set last night you will probably have captured lots of pictures of horses. Hopefully you might obtain pictures of more interesting things higher up on the trek. You are now walking through the most beautiful virgin forest alongside the noisy turbulent river constantly cascading down rapids. After 2 hours you come to a new wooden bridge at a river junction, 2,949m/9,659ft. You are basically gently ascending all day within a gorge that squeezes and squeezes. There are impressive rocky peaks and cliffs framed at the end of the valley. It is a great feeling to be out in the wild and away from human habitation. About 3 hours into the trek you come to a campsite called Tsho Zhow, further on there is a girder bridge and there are two rather smart wooden chalets behind a palisade fence. This is where the Royal Family stay before they climb up to the 'high route'. Apparently there are some very special meditation temples at Chungge and Lungsipang. You have to have special permits to take this route, but in any case it would not be good for acclimatisation as it involves 1,500m of ascent. Opposite the wooden chalets there are some very impressive cliffs and some short vertical cliffs on the left hand side with a swampy meadow. You will aim to camp at Gophu (sometimes called Kuphu). Day 9 - Trek to Tsawuu, 3,849m/12,627ft, beyond Tsampa – 8 hours. A stunning walk on the right hand side of the river with beetling cliffs and great roaring rapids. Parts of the trail are a bit boggy and slippery in a couple of places. The further up the trail you go the more impressive the facing cliffs become. After about 4 hours you come to a 'lake' where the river funnels into a very narrow slot forcing a lake to form. You might see ducks here. You are climbing up now through sloping meadows where you might encounter herds of yaks. Incidentally look out for any white yaks. They are thought to be 'lucky' and are more valuable than your common-or-garden black yaks! Finally you come to a three pronged valley junction. Off to your right is the last small army outpost and the valley leading to the Mon La Karchung La. This is the pass leading into Tibet that F.M. Bailey and Captain M.R.C. Meade crossed in 1922. It was their survey work from the top of the pass that fixed the height for Gangkar Punsum. The left prong of the valley leads further up to the source of the Chamkha Chhu River. Sitting on a shoulder of the mountain at this junction of rivers is a small and ancient temple. Two of the statues were recently donated by one of the queens of the 4th king. The trees have all but disappeared by now and rugged mountains are a welcome site. You might want to visit the army camp to see the rough conditions that the soldiers live in on their two month tour of duty. From there it is a short distance to cross a wooden cantilevered bridge leading to the temple. It would be good to offer prayers here before continuing for another hour to reach camp at the small hamlet of Tsawuu some way beyond the junction which is called Tsampa. It is not always possible to camp at Tsawuu in which case you may camp next to the river below the temple at Tsampa. Day 10 - Trek to Shingo, 4,209m/13,808ft – 4½ hours. To aid acclimatisation there are now two short days. The first to Shingo only takes 4½ hours. It is getting really exciting now and if the weather is clear you will see framed at the end of the valley the huge peaks on the Tibetan border. Leaving camp you soon plunge back into the forest and shortly climb for quite a long way uphill. Eventually you come to a 'shoulder' with prayer flags and an old square chorten (30 mins from camp). Shortly after this there is a 'yak gateway'. Local people build these either from stone and timbers and/or felled trees to keep the yaks from straying too far. The trees now give way to open hillside and you traverse for some way even descending a little to meet the river again. Rounding a corner you come to a large meadow with four yak herder huts. This is Gewathang (1 hour 10 mins from camp). You should meet very friendly, shy people who will be astonished to see these strange foreigners! From here you cross a meadow and enter an enchanted forest. Very pretty indeed. Perhaps it is another half hour to a second yak gate. You are nearly out of the forest again and there is some proper boulder hopping through rhododendron and juniper. More herds of yaks for sure. After 2½ hrs you come to another group of four to five yak huts called Shewwa, 3,905m/12,812ft. Another 30 mins and you come to a third yak gate. After 4 ½ hrs you arrive at Shingo having traversed a long way under some seriously impressive rock cliffs on your right hand side. The river is now your close companion again on your left. At Shingo there are another four stone/wooden huts. It is interesting that there is a strong tradition with all the local people that they take all their herds of yaks to the topmost pastures in the summer months. Each family knows its own particular yak huts and the area their yaks are allowed to graze. In the autumn they move downwards in an orderly way, each family moving down on certain dates to avoid their herd of yaks having fights with other herds of yaks. At Shingo hot washing water can be organised for the shower tent and washing clothes or you might like to go on short walks to explore the locality. Day 11 - Trek to Bamurpa, 4,490m/ 14,730ft - 4 hours. There are now some astounding views of the peaks at the head of the valley. The biggest of these is Melunghi Gang 7,000m/22,965ft. A Japanese expedition requested permission to climb this peak but were refused. It still remains unclimbed. Another thankfully short day all of which aids acclimatisation, just 4 hours to Bamurpa. Leaving camp there is an easy angled rise to some prayer flags on a shoulder 10 mins from camp. You then drop down to the river and begin to turn the slight right hand corner keeping to the right of the stream. The trees have all disappeared now and there are easy grass slopes, boulder fields, wild azalea, stunted juniper and carpets of bright blue gentians. 20 mins from the prayer flags you come to another yak gate and beyond it more prayer flags. The Chamkha Chhu valley is spread out below you and hemmed in by grey granite peaks, steep mountain sides, rock gullies and enticing side valleys. The main river is still a powerful torrent and joined here and there by side streams. Autumn colours add to the beauty. You may well see herds of Blue Sheep here. After 25 minutes you come to another set of four or five yak herder huts with buildings both sides of the river. You reach another yak gate after half an hour beyond this after climbing a slope. The next set of yak herder huts at Cedi is half an hours walk ahead. Beyond there again after half an hour you come to two rock boulder enclosures. We imagine these are for keeping animals safe at night. Having turned the corner you are now heading directly up the valley towards the wall of snow and ice at the end. After a bit of boggy land you come to Bamurpa. This is a large flat area with a meadow the size of half a dozen football pitches, just away from the river with again three or four yak herder huts. The impressive rock peaks here have serrated tops with occasional leaning towers and unusual tottering pinnacles. Another afternoon to rest and relax, or look for an interesting place for the camera trap. If it is a clear night spend a little time before turning in to do a bit of shooting star spotting. Day 12 - Explore to beyond Buurtsam - possible max altitude 4,800m/15,750ft - and return to Bamurpa - 6 hours. With a long slow ascent to altitude you should be nicely acclimatised, and today you can make an exploration right up towards Melunghi Gang. You should reach an altitude of around 4,900m/16,000ft. As far as we know our 2014 group were the first Brits to set foot in this area. There are no records but we think only the American mountaineering expedition in 1985 have been up here before us. There were rumours of a USA company, Geo Adventure, but no one is quite sure what they did. You will get your first views of Gangkar Punsum as you just see parts of the summit ridge off to the west. You will also see a string of beautiful peaks running off to the east towards the Mon La Karchung La. First thing in the morning you will probably hear Himalayan Pheasant not far from camp, and during the day you may well see large birds of prey cruising the thermals and even smaller falcons hovering on ridges. You should see Blue Sheep again with luck. For this day we suggest walking up the right hand side of the river. There are only indistinct occasional paths and you just have to follow your nose. On a previous expedition, Steve Berry's group made the mistake of traversing the right hand slopes quite high above the valley floor. They found this to be slow hard work and it would probably be better to stay closer to the river and head straight for the moraine. Their high point was on the crest of part of the moraine at a height of 4,800m/15,750ft. However, if you make faster progress than they did you could certainly go on further from here if time and energy allowed. If you do follow up beside the river you will eventually come to Buurtsum, a group of about six stone house/yak herder huts in a dilapidated state with no roofs. Certainly you should be rewarded with very up close and personal views of Melunghi Gang and its neighbours. You look down on huge glaciers, and straight ahead at extremely steep and frighteningly difficult looking mountain sides. A magnificent day! Day 13 - Trek to Zhigeyphu Valley, 4,994m/16,384ft - 5 hours. Zhigeyphu valley is an incredibly beautiful region that very few westerners have ever seen, let alone explored. The main valley system leads almost directly towards Gangkar Punsum and on the western side of the region is a line of mountains beyond which we know lies the Mangde Chhu valley system. In 1986 Mountain Kingdoms' M.D. Steve Berry led a British expedition to try and climb Gangkar Punsum and their approach to the mountain was up the Mangde Chuu. When Steve and companions went back in 2014 they had hoped to perhaps find a connecting pass from Zhigeyphu valley through to the Mangde Chuu side. The one pass they did reach (the closest to Gangkar Punsum) did not provide a viable route through but there are four or five other 'passes' that could be explored to see where they lead. There is so much to do but the first thing having reached your base camp in Zhigeyphu valley is to climb one of the adjoining ridges that will give you a very fine overview of the area. In any event, today is all about getting to the base camp at a place called Zhigeyphu. It is not a long day only 4 or 5 hours, but it feels like quite a long uphill climb. Leaving camp you first have to wade across the river. This is not too difficult but cold! You then walk the short distance back down the river to the yak huts opposite Bamurpa. From here sandy zigzags lead up the front of a ridge to prayer flags. The path then starts to traverse into the upper reaches of Zhigeyphu valley. After about 2 hours you come to some more yak herder stone houses (724m/15,500ft) and another hour on from here you come to the top of a rise (4,916m/16,130ft). Just ahead of you there are more prayer flags and a 'pass' (approximately 5,000m/16,500ft). This really is the true 'entrance' to Zhigeyphu valley. Just down from here is a very nice campsite next to three yak herder huts and three enclosures. If the weather is clear you have the most extraordinary view of Gangkar Punsum. Day 14 - Explore Zhigeyphu Valley. Ask your guide to wake you early for dawn views of Gangkar Punsum. Spectacular! To your north there are a rounded series of ridges and climbing to the top of the ones immediately north of camp will provide extremely valuable acclimatisation and give you an overview. From your base it's about 45 mins slowly uphill to the first cairn, 5,184m/17,008ft, and is then a long slow but gradual uphill hike to the top of the ridge. This will take you a further 35 - 45 mins. Hopefully the set of prayer flags and chortens that we built in 2014 are still there. The top of the ridge forms a sort of 'corner' and has a height of 5,421m/17,785ft. The views from here are both breath-taking and humbling. Childlike excitement might be what you experience at this point at the thought of so much beautiful country to explore. From here, assuming a clear day of course, you can see the various possible 'passes' that might lead through to the Mangde Chuu valley system to the west. You will also be able to pick out at least eleven lakes scattered throughout Zhigeyphu valley and there are almost certainly more than that hidden away in corners of the region as a whole. Strangely you occasionally see two or even three lakes next to each other each one with a different colour. Strange but true! Worth mentioning here are the incredible 'hard' mosses, lichens, strange plants, and stunted ferns that cover the hillsides here. Truly extraordinary and beautiful. Some of the large mosses are so hard you can stand on them! Descending from your high point you can actually keep over to the western edge of the ridge you are on and drop down to the obvious huge circular turquoise lake. This must be a holy place as there are several lots of prayer flags around the edge of the lake, the main group being quite elaborate. There is a local legend that says a mermaid lives in the lake. Another legend tells how in the sixteen hundreds there was an intelligent raven living near Gangkar Punsum who, seeing a Tibetan army gathering to attack Bhutan, flew to Bumthang and warned the Bhutanese of their danger. The Raven Crown that the kings wear on ceremonial occasions is connected with this legend. From here it is less than two hours back to camp. Day 15 - Further exploration in Zhigeyphu Valley. So many options, so little time! You could for instance attempt to hike to the top of the obvious rocky mountain south of the camp. Our 2014 party felt sure it could be done in a day with an early start. Alternatively you could explore one of the side valleys, or indeed have a look at some of the 'passes' that might possibly lead through to the Mangde Chuu valley. No doubt a democratic planning meeting on the evening of day 14 will have focused your ambitions. Remember to allow plenty of time to get back to camp before dark, but in any case pack a head torch just in case. In 2014 Steve Berry and party reached a high col, nearest to Gangkar Punsum, and it was here that the Bhutanese Guide Karma Tenzing spotted the strange set of tracks that are pictured later in this itinerary. Do watch 'Footsteps in the Snow' on our website for a detailed explanation! Day 16 - Trek to clearing in forest beyond the Shingo Bridge, 4,072m/13,358ft - 5½ hours. A sad farewell has to be made, and your back has to turn on this beautiful place. Amazingly it only takes about 2 hours to drop back down to the yak herder huts next to the river. However, instead of crossing the river it is best to stay on the right hand bank going down. You may stop for lunch opposite Sedi. Incidentally just after leaving camp and at the prayer flagged 'pass' look out to the distant mountains on the horizon with binoculars to spot an amazing rock tower. Most unusual! Bigger at the top than at the bottom. Quite bizarre! About an hour on from lunch you come to the main bridge across the river and just down from that is the campsite in a clearing. Day 17 - Trek to Tsampa. Visit monastery. Camp by river, 3,720m/12,205ft - 3½ hours. A nice short easy day down to Tsampa. 15 minutes from camp you come to a yak gate and after that three yak huts and enclosures in a large clearing next to the river. This is a further half hour from the yak gate. Just 20 mins on from here there is a place where sulphurous water bubbles up from the ground. It is marked by a prayer flag and there is a silver mug left beside the bubbling water for people to drink the efficacious waters. After this there is a short uphill to a gulley with a stream and immediately afterwards another yak gate. 40 mins on from here you come to more yak huts where the lady of the house might like to sell you some hand woven belts. Another hour and a half down through the forest and you will arrive at Tsampa, where you might like to visit the monastery again. Dropping down from here it is just a few mins to cross the river by a substantial bridge and make camp in a clearing next to the river. Day 18 - Trek to Tsho Shap, 4,420m/14,501ft - 5½ hours. Leaving camp you climb up to join the track that will eventually take you over the Thole La pass. Having joined the main trail you now have a steep set of zigzags uphill, next to some impressive cliffs. Looking out and back you can see the army post, the valley leading to the Mon La Karchung La and the temple. Carry on steeply uphill and eventually you come out above the tree line and traverse a stunningly beautiful V valley with some beautiful peaks at the end, the main one of which looks like a castle out of Mordor. This is the essence of Bhutan and you will almost certainly meet local people and their yaks. Previously, Steve's group met a pair of Tibetan lamas who had crossed illicitly from India into Bhutan and were trying to make their way into Tibet. This is a lovely walk up the right hand side of the valley with lots of autumn colours and many of the hillsides completely swathed in rhododendron. Flocks of rock pigeon have acrobatic fun and we called them 'the Red Sparrows'! After 2½ hours you come to a col with one ruined house and two enclosures, 4,090m/13,418ft. Less than 2½ hrs further on you come to three yak herder huts and prayer flags and the valley turns left here. It is only then another 40 mins to come to the magical camp next to the edge of the lake of Tsho Shap. Day 19 - Cross the Thole La pass, 4,766m/15,637ft. Trek to Tashi Sa just beyond Labrong, 4,117m /13,506ft - 6 hours. A big day! To our certain knowledge 'foreigners' have never been this way, and it is a real thrill to have this place to yourself. Again stunning scenery and all the pleasure of achieving the crossing of a high pass. Firstly, boulder hop to cross the stream issuing from the lake (take care as early in the morning the rocks can be icy). You then follow a vague path along the side of the lake at the far end of which is a single yak herders hut. From here it is a steep climb to the Thole La, but only 2 hrs from camp and if you are lucky enough to have a clear day, the views are outstanding. From the pass if you have a map and a good compass you can pick out the peak of Kula Kangri in Tibet. This is the other huge peak that sits behind Gangkar Punsum. Turn round and you are basically looking south over Bhutan. Ahead and below you is a huge valley with a river in the bottom which disappears in the distance. This is the way you are now heading. However just look to the west and you can just pick out a zigzag path the locals say leads through to the hot springs at Dur Tsachu. Reluctantly you now leave the pass and follow the path diving steeply down to the floor of a huge valley. It is some 427m/1,400ft of descent. At the bottom of the descent there is a deserted yak hut which makes a good picnic venue. From lunch you follow the river on its left hand side going down past huge grey granite mountains on either side. On the first rock face on the right hand side is perched a huge balanced tower of rock and having gone past and looking back it sort of disappears into the face and can no longer be picked out. Again the path is boggy in places and there are a couple of places where it is easier to bolder hop down the shallow stream bed. Incidentally, always keep your eyes open for interesting or unusual animal prints. It was around here where we came across some bear prints, but up in Zhigeyphu valley we saw some very clear prints that must have been a snow leopard or even perhaps a tiger. Good possibilities of spotting Blue Sheep in this area. About 5½ hrs from camp you come to the bridge at Labrong. Cross this but continue to traverse down the hillside for another half hour to a place called Tashi Sa. As you traverse this path on the mountainside it doesn't seem possible that there is a campsite but it is 'hidden'. 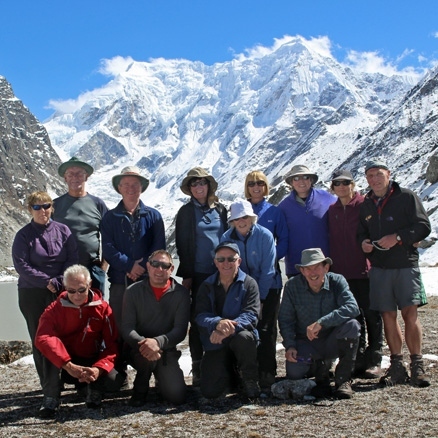 Day 20 - Trek to Chokchum, 3,247m/10,652ft - 6½ hours. From camp it is about 45 mins back down into the jungle to reach the junction. If you were to turn right here it would take you to Tsochenchen, then over the Dhule La, down to the hot springs at Dur Satchu, and from there on to Gangkar Punsum Base Camp on the Mangde Chuu side. However you are now on your way out back down to Bumthang and 20 minutes from the junction you come to a bridge. From here it is about 2½ hours to Kurzang's rather muddy campsite which you will pass by. There is a wooden shelter there. Further on down there is a riverside cliff path and 5 hours from camp you reach the main bridge that takes you to the other side. It is then about an hours steep slog up through the forest to get to the camp at Chokchum. This is a clearing high up on the right hand side of the river. Day 21 - Trek to Dur, 2,700m/8,858ft - 4 hours. Drive to Jakar. The last of your fifteen days on trek and your tired legs will be looking forward to a rest and the thought of a bath and a comfortable bed to sleep in is somewhat attractive. Be aware there are some famous mud sections though it is always possible to bypass the worst of it. Don't let me put you off. This is still a good and interesting walk through prime untouched forest with one or two fantastic sections next to the river. Eventually 'civilization' begins to appear. You see fields, meet people and encounter proper paths and houses. At Dur there is a suspension bridge and on the other side a large chorten. We recommend you do at least three Koras to thank the gods for your safe return. Then congratulations all round are in order and if you are lucky the boys with the bus have brought some beer and sandwiches. It is now time to make some speeches and hand out tips to your cool, hardworking gang of Bhutanese staff and horsemen. Then all that remains is a half hour drive to the lodge in Jakar. Day 22 - Fly to Paro. Today you take the internal flight from Bumthang to Paro. On arrival at Paro airport you will be met and taken to your hotel. There may be time today to see the some of the treasures from Bhutan's National Museum. The Museum itself was closed following the earthquake in 2011, and many of the artefacts and displays were temporarily housed in a nearby building. Hopefully the main building will be open in due course. If for any reason the flight is cancelled we have allowed enough time to drive back to Paro in time to catch the flight back to Kathmandu. Day 23 - Morning walk to view Taktsang Monastery. Afternoon at leisure. A short drive beyond Paro town takes you to the trailhead for the walk up to the famous 'Tiger's Nest', Taktsang Monastery. The monastery is perched some 600m/2,000ft up on a cliff overlooking the valley and was said to be where the legendary Indian saint, Guru Padma Sambhava, flew from Tibet on the back of a tiger to defeat five demons, who were opposing the spread of Buddhism in Bhutan. It is a steep uphill walk through woods, of about 1½-2hrs, to reach a tea house (an ascent of 340m/1,115ft.) Apart from offering welcome refreshment this tea house is one of the principle viewpoints of Taktsang, and those that prefer not to climb any further can relax here whilst others continue on. If there is a particular religious gathering or VIP visit in progress, you will not be able to enter the monastery but the further half an hour's ascent is well worth it in any case, as it brings you to another viewpoint directly across from Taktsang. If you are able to make a visit, the final section of the walk takes you from here steeply down 100m/330ft into the gorge that separates you from the monastery and then climbs back up again to reach the monastery gate. You descend back to the valley floor by your outward route. The full walk to Taktsang and back involves approximately 740m/2,428ft of ascent and takes about 4 hours. In the afternoon you have time to relax and reflect on your adventures or for further sightseeing. Day 24 - Fly to Kathmandu. Transfer to hotel. You will be transferred to the airport where you will bid farewell to your guide and driver. Then once again you will enjoy the sensational take-off and scenic Himalayan flight past Chomolhari, Bhutan's second highest peak, past Kangchenjunga and Everest back to Kathmandu, where you transfer to the Shangri La Hotel. Day 25 - Fly to London. ...So may I say now that we were very well supported by Karma Tenzin, Lotay and their team (Dorji, Phub Tshering and Dophu) and, indeed, the horsemen from Dur. Cooperation throughout the trek was exemplary and created a very happy spirit for all concerned. The meals were terrific and Lotay's skill is remarkable, ensuring that supplies were used steadily throughout the trek and most supplies lasted to the final day... The whole experience seems to be 'thought through'; timings, logistics, acclimatisation, supplies, staffing all fit; most comforting. Best wishes and thanks for a splendid trip. What I liked about travelling with Mountain Kingdoms was that their client wellbeing is paramount, their long standing relationship with their local agents ensured a totally trouble free trip and the quality of hotels outside the trek. Thank you all for making the Gangkar Punsum trip such a memorably fantastic one. May our next adventures be so fortunate.